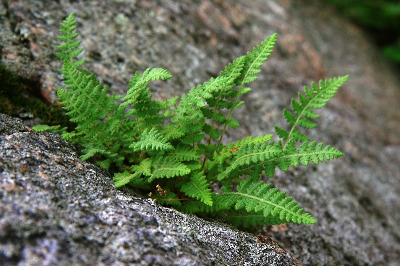 Dry, sunny or partly shaded cliffs and ledges of non-calcareous rock; our most common Woodsia and normally distinctive in with its coat of rusty scales and hairs. An 1832 collection of this species from along the St. Mary’s River by Douglass Houghton is sometimes attributed to Chippewa County, but came from the Ontario side of the river, where Houghton was travelling on the day the plant was collected. Another collection said to be from "rock cliffs along shore" of Summer Island, Delta County, and collected during a summer science camp for students is not mapped as this island is entirely limestone, an inappropriate habitat both for W. ilvensis, and for the small fragment of Selaginella rupestris mixed with the Woodsia specimen. Where growing with Woodsia oregana, the intermediate hybrid W. ×abbeae Butters may occur. 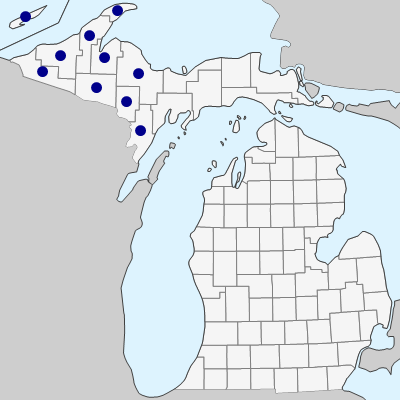 Michigan collections are known from Dickinson, Keweenaw, Marquette, and Ontonagon Cos. This hybrid is reminiscent of W. oregana, but in addition to the sparse glands, W. ×abbeae has scattered multicellular hairs on the underside of the blades. MICHIGAN FLORA ONLINE. A. A. Reznicek, E. G. Voss, & B. S. Walters. February 2011. University of Michigan. Web. April 21, 2019. https://michiganflora.net/species.aspx?id=2810.